I’ve told you all about American Art Pottery in a previous blog. It’s a fascinating topic, because it is evidence of the major impact of women artists on the American art scene, one of the earliest instances. If we look at the number of women involved in ceramics in Cincinnati alone, we realize what a craze art pottery became between the 1870s and the first decade of the 1900s. Not only did these artists form ceramic clubs and societies, many women were founders of major art pottery firms. Many museums at the time were buying art pottery the year it was made, as is the case with this Mary Louise McLaughlin piece. This is evidence of how highly esteemed an art form “art pottery” was, and still is today judging by the prices such works fetch in auctions. 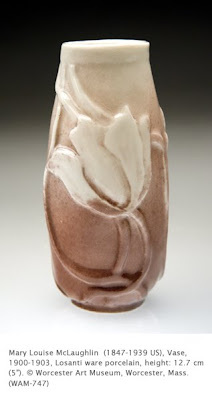 Mary Louise McLaughlin was a pioneer in art pottery. She studied furniture carving during the late 1860s in a studio in her native Cincinnati, and was also introduced to pottery painting in the same class. Ceramics thereafter dominated her interest. Her book entitled “China Painting: A Practical Manual for the Use of Amateurs in the Decoration of Hard Porcelain” (1877/1911) sold 23,000 copies, indicating the growing popularity of art pottery in the US. In the 1876 Centennial Exhibition in Philadelphia, McLaughlin exhibited her work and sold more pieces than fellow exhibitor Mary Longworth Nichols, the founder of Rookwood Pottery. At that exhibition McLaughlin was greatly impressed by an exhibit of French faience (a glaze with high glass content) ceramics and decided to go about finding a way to imitate that glaze with slip underglaze decoration. This technique involves a colored slip (clay mixed with water to a creamy consistency) applied to a vessel in combination with a colored silicate glaze over it. She experimented with combinations of colors and what resulted was the “Cincinnati Faience” glaze. She formed the Cincinnati Pottery Club in 1879, and the enthusiasm with which the “Cincinnati Faience” was received nation-wide helped spawn the craze for art pottery in the United States. This ovoid form with Art Nouveau decoration is typical of the period when McLaughlin experimented with glazes that imitated metal. These glazes on porcelain were the start of what McLaughlin called “Losantiware.” In this particular piece she was imitating the patina of oxidized copper. Typical of most glazes that came from many pottery firms in Cincinnati, the glaze is thickly and evenly applied, with yellow underslip painting added to give the color a warm richness. This imitation of metallic effects won McLaughlin a medal at the Exposition Universelle in Paris in 1900. I love the Art Nouveau period for pottery. There were so many unique and beautiful pieces created that the modern pieces cast today simply don't hold a candle to.